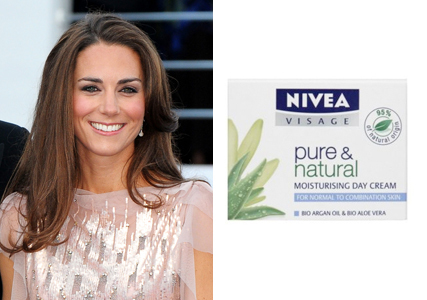 I have been curious about Nivea Visage Q10 Plus ever since I have heard that the Duchess of Cambridge herself, Kate Middleton, was spotted purchasing a jar of Nivea Visage Pure & Natural Day Cream for £5.10. Anyone would have expected someone of her prominence will be patronizing higher end brands. She is said to be a fan of this Nivea Visage Q10 Plus collection as well. 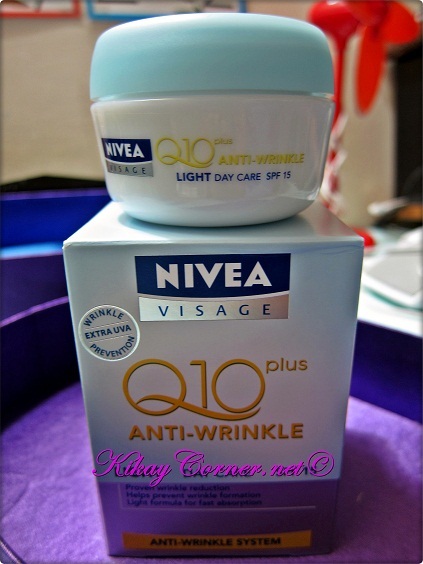 This is why as soon as my current moisturizer runs out, I’m going to give this Nivea Visage Q10 Plus range a try. I have to consider as well, of course, if the consistency of the products can fit our very humid tropical weather. I will let you know how it fares then. But given my loyalty to a few of Nivea’s products like the Express Hydration lotion, I actually have high hopes about this. These Nivea products are currently sitting on my dresser and waiting for their queue. Like I generally would, before I use products for my skin, I make sure I know what it is made of and what it purposed to do. Allow me to do that just now. 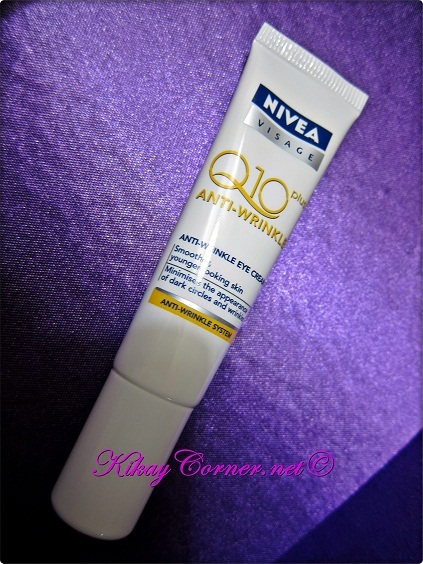 The Nivea Visage Q10 Collection is said to diminish the appearance of wrinkles with its Q10 ingredient. Since I am much of a fan of organic stuff, I have heard a lot about this Q10 co-enzyme being available through natural supplements. This is actually the first time I heard that it is used by a skin care line. Why not, when Q10, being a co-enzyme can work as an energizer that allows our skin to regenerate because of its anti-oxidative properties, right? This is generally what this Nivea range is all about, to keep wrinkles at bay. As someone who is turning 35 in a few days, this is something I think I can make use of. 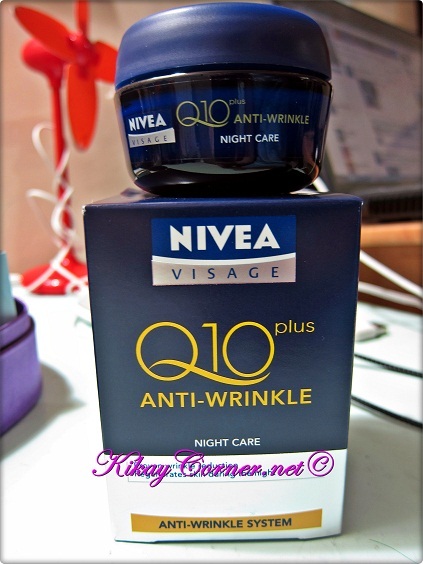 Nivea Visage Anti-Wrinkle Q10 Plus Night Cream is formulated to replenish the skin during the night with Q10 anti-wrinkle action after the effects of daily stress. This intensively moisturizing cream includes Panthenol and regenerates the skin cells while you sleep. Q10 reduces is said to reduce the wrinkles around the eye area where fine skin is prone to lines. This eye cream is enriched with gentle UVA and UVB filters, suitable for the delicate skin around the eyes. The formula is said to protect eh skin against the signs of sun-related aging. With Q10 anti-wrinkle action, plus an optimised UVA filter system, together with SPF15, this day cream is formulated to smooth and protect the skin. It contains Vitamin E as well. 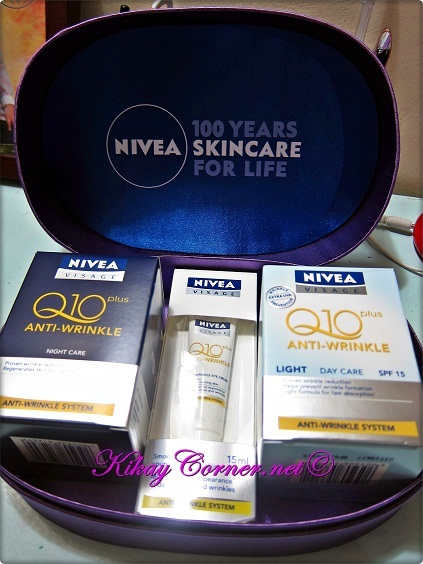 The NIVEA Q10+ Anti-Wrinkle is available in leading supermarkets, department stores, drugstores and groceries at affordable prices: Light Day Care at Php 385.00; Night Care at Php 385.000; Eye Cream at Php 350.00 and Cleansing Milk at Php 200.00. 1. You have to be a “liker” of Kikay Corner on Facebook. 3. When you’re done with the Facebook status wall update, go to the comments section of this post and enter the link of your Facebook entry with your name and email address. 4. Contest is open to everyone who has a local address. Free Shipping. 5. One entry per person, per day only. 6. Deadline for entries is one week from now, September 30, 2011 at 11:59PM. Winner will be raffled off via random.org. revised edition from first post!